Bitte beacht­en: Dieser Kurs wird in Englisch durchge­führt. Cer­ti­fy as a SAFe 4 Release Train Engi­neer and become the Lean-Agile Facil­i­ta­tor and Enabler to deliv­er end-to-end val­ue through ARTs and large solu­tions in an enter­prise SAFe envi­ron­ment. In this advanced three-day work­shop, you will gain an in-depth under­stand­ing of the role and respon­si­bil­i­ties of a Release Train Engi­neer (RTE) in the SAFe enter­prise. Through expe­ri­en­tial learn­ing, you will learn how to facil­i­tate and enable end-to-end val­ue deliv­ery through Agile Release Trains (ARTs) and val­ue streams. You will also learn how to build a high-per­form­ing ART by becom­ing a ser­vant leader and coach, and how to plan and exe­cute a Pro­gram Incre­ment (PI) plan­ning event, the pri­mar­i­ly enabler of align­ment through­out all lev­els of a SAFe orga­ni­za­tion. 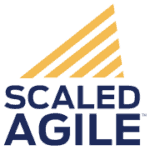 Scaled Agile’s SAFe Release Train Engi­neer exam main­tains rig­or­ous qual­i­ty stan­dards ensur­ing that those who have earned the cer­ti­fi­ca­tion are well pre­pared to effec­tive­ly ful­fill their role in a SAFe enter­prise. Make sure to read the Cer­ti­fi­ca­tion Infor­ma­tion below. To ful­ly ben­e­fit from this class, you should have at least one cur­rent SAFe Cer­ti­fi­ca­tion, and launched or par­tic­i­pat­ed in at least one ART and one PI. Atten­dees must attend all three days in order to qual­i­fy for the exam. Renew­al fee: $295. Renew­al fee for the RTE cer­ti­fi­ca­tion is includ­ed in SPC renew­al (if cur­rent SPC). Atten­dees may be eli­gi­ble to apply for 21 PDUs toward their con­tin­u­ing edu­ca­tion require­ments with the Project Man­age­ment Insti­tute (PMI) for PMP and PMI-ACP cer­ti­fi­ca­tions. Atten­dees may be eli­gi­ble to apply for SEUs under cat­e­go­ry C, toward earn­ing or renew­ing their CSP through Scrum Alliance. 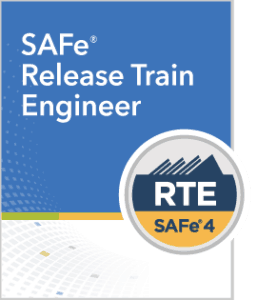 A SAFe 4 Cer­ti­fied Release Train Engi­neer (RTE) is a SAFe pro­gram ser­vant leader and coach­ing pro­fes­sion­al respon­si­ble for dri­ving end-to-end deliv­ery of val­ue in a sin­gle pro­gram or val­ue stream in a Lean-Agile enter­prise. This indi­vid­ual will be expect­ed to per­form these tasks with lim­it­ed assis­tance from peers, prod­uct doc­u­men­ta­tion, and sup­port resources. Retake pol­i­cy: sec­ond attempt on exam (first retake) can be done imme­di­ate­ly after first attempt. Third attempt requires a 10 day wait; fourth attempt requires a 30 day wait. Each retake attempt is $150. 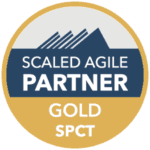 Con­tact support@scaledagile.com for any retake ques­tions.